Aegina has long been recognised as a major production centre of a variety of widely exported ceramic containers not only in the relatively recent past but also in Classical antiquity and especially during the Middle and Late Bronze Age. 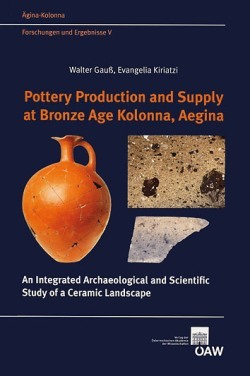 Moreover, the prehistoric ceramic industry based on Aegina has become an increasingly important phenomenon in recent scholarship dealing with the rise of complex societies in the Aegean world during 2nd millennium BC. Such persistence on pottery production on Aegina through time renders obvious that a combination of factors, such as socio-economic, historical and geographical ones, as well as the locally available raw materials and the attraction of Aeginetan ceramics at other sites, must be taken into consideration in addressing the development of a specialized potting centre on the island. This study is the first to undertake a comprehensive look at the Aeginetan ceramic industry during much of the Bronze Age (ca. 2500-1200 BC), aiming at shedding light upon the factors influencing transformations in potting traditions, and the growth and decline of a specialised pottery production centre on Aegina. Advocating a landscape approach, it concentrates not only on pottery production but also on supply and consumption of ceramic vessels on the island. The systematic stylistic study of the formal attributes of local products and imports at the site of Kolonna is combined with the investigation of their manufacturing technology and the compositional characterisation of their fabrics through petrographic and chemical analysis. This integrated archaeological and scientific examination of the pottery, together with research on the island’s resources, replication experiments and ethnoarchaeology, provides the ground for the reconstruction of the local potting traditions and the understanding variability observed within and across certain periods of the Bronze Age.